This is the time of year when folks here in north central Montana dream of getting away to warmer places, but not me…not today, anyway. Today I will wrap winter up in a cozy warm quilt made with Island Batik’s new “Icicle” collection, which should be arriving at your local quilt shop right about now. Island Batik supplied me with a half-yard of each of the twenty pieces in this collection, and for the challenge, I had to use some of each of the fabrics. As it turned out, I only used about half of each piece, so I have written the pattern calling for a “Stack”…a 42-piece collection of 10″ squares…which will give you more than enough 4.5” squares to make this quilt. The blues and whites, pine trees, deer, and snowflakes, reminded me of Glacier National Park, so I called it “Many Glacier” after an area in the northeast portion of the park. The main block is a traditional block called “Rocky Mountains”. I enlarged the 12″ block to 16″ (finished sizes). Sections 2 and 3 have an 8″ version of the Rocky Mountains block, with 4-patches and half-square triangles added. Next, I constructed the upper left and upper right corner sections. These were made four squares wide, so they match the width of the center block. 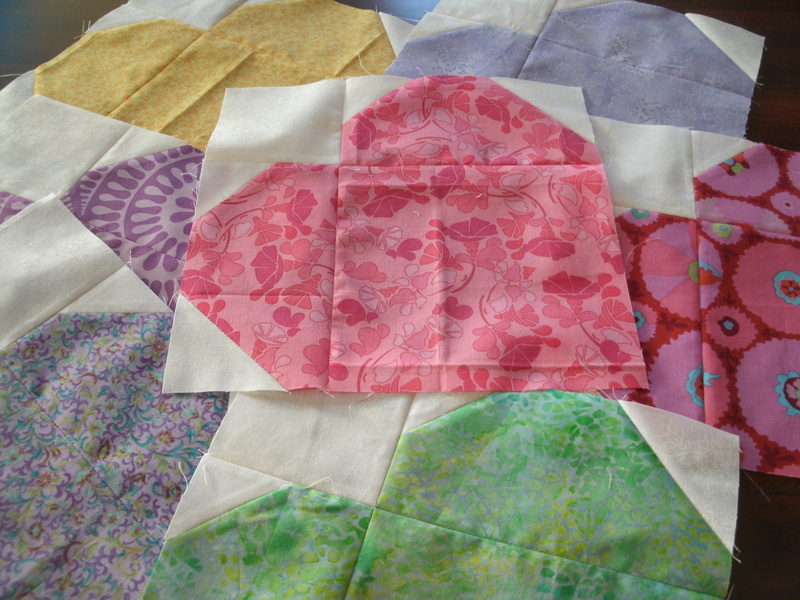 My goal was to wind up with just a few long seams running diagonally across the quilt. The purpose of the navy and light blue 4-patches is to spread the navy blue from the center block out a little bit. On paper, it seemed to make a “black hole” in the center of my quilt because it’s so much darker than the other blues. It held my attention too long, so I needed a “squirrel” element to draw my eye out to the blue fields. The next step was to fill in that center triangle at the top. I had the whole collection of 20-plus fabrics to work with in this quilt, but because I had used the darkest blues in the blocks and “ribbon”, I only wanted to use the lighter blues and just a few of the white prints in the field. I had maybe a dozen fabrics to work with, then, and it was a real challenge to keep the individual prints from winding up side-by-side at some point. Once the top sections were complete, I started on the lower sections. First the sides, and then that big center triangle. You can see now where the sections can be sewn into three diagonal units, and the units sewn together to complete the quilt top. 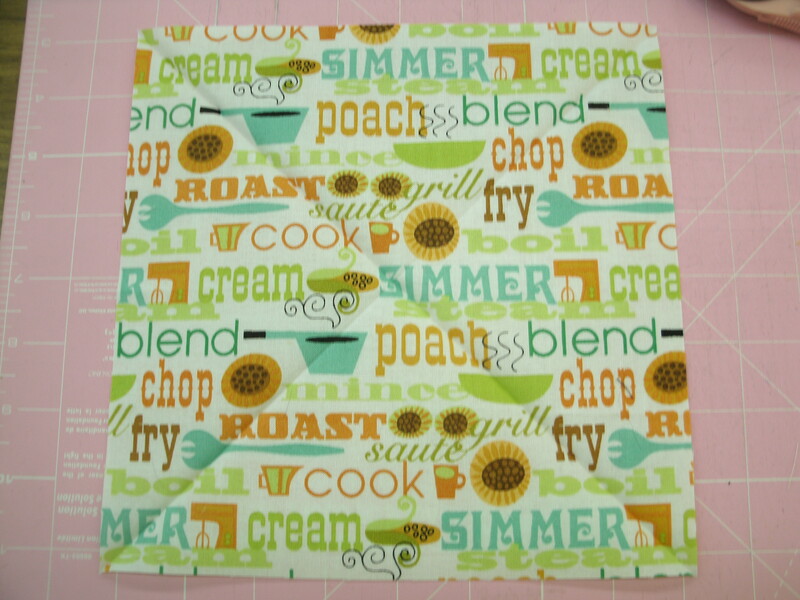 I wasn’t planning to originally, but I did wind up adding a 2″ (finished) border all around, because I was sending the top out to be machine quilted, and I was not certain I had remembered to back-stitch all of the seams on the outer edge. I do like how the border allows the “glaciers” to float on the background. Many Glacier is my final quilt for the 2018 Island Batik Ambassadors program, and it just may be my favorite. In addition to the fabulous (and generous) “Icicle” collection of fabrics provided by Island Batik, this quilt was sewn with 50wt 100% cotton thread provided by Aurifil, and is quilted with Hobbs’ Heirloom® white cotton batting, also supplied by the company. 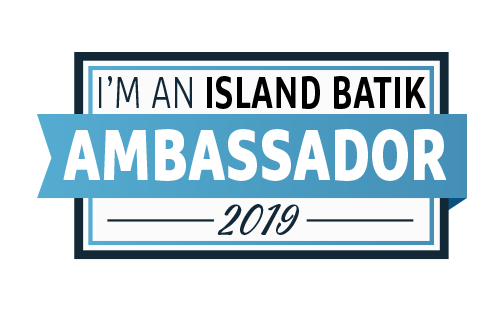 It’s been my honor to serve as a 2018 Island Batik Ambassador, and I am thrilled to announce that they’re keeping me on for the 2019 program! Ambassador Terri Vanden Bosch also had the Icicle collection. Visit her blog, Meanderings along Lizard Creek, to see what she did with it. Click HERE to return to the Island Batik blog to make sure you haven’t missed an exciting stop on our “Getaway” blog hop. And remember to sign up for the prize drawing…two of you will win a stack of Island Batik fat quarters! In the case of this 45″x 54″ quilt/wallhanging I designed for Island Batik’s “Looking Back” challenge, the title is sadly ironic. In mid March, my life was turned upside down, when my mother was diagnosed with late-stage pancreatic cancer. My weekends, usually my quilting time, were suddenly spent sitting by Mom’s hospital bed, and the top for this quilt was sewn during the few evenings I had to myself in a hotel room. The doctors had told us we might have up to six months. As it turned out, we had just six weeks. We said our goodbyes on May 15th. For the last week of her earthly life, I slept in a recliner next to Mom’s bed at Peace Hospice in Great Falls. One night I dreamt of her passing from this world into the next, and into the welcoming arms of my grandparents and a host of friends and family members who have gone before. I have tried several times to change the title for this quilt, but it won’t let me. “Plenty of Time” just seems right. Thanks to Island Batiks for providing the fabrics. I used a package of 5″ squares, and the “Stash Builder” bundle of 5″ x 21″ strips, cut into 5″ squares, plus a few larger scraps and yardage. 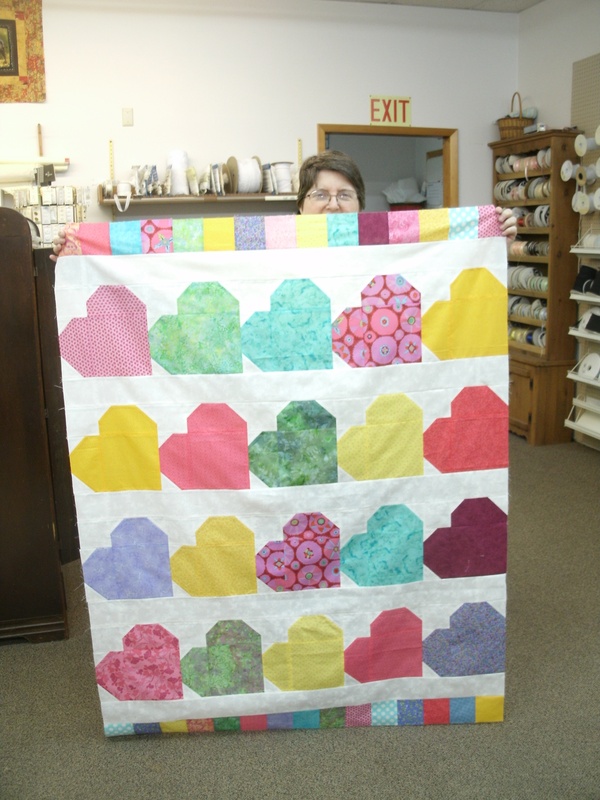 The quilt was sewn with thread provided by Aurifil, and quilted by Kathy Brown at the Creative Needle in Shelby MT. My, how colorful you are! 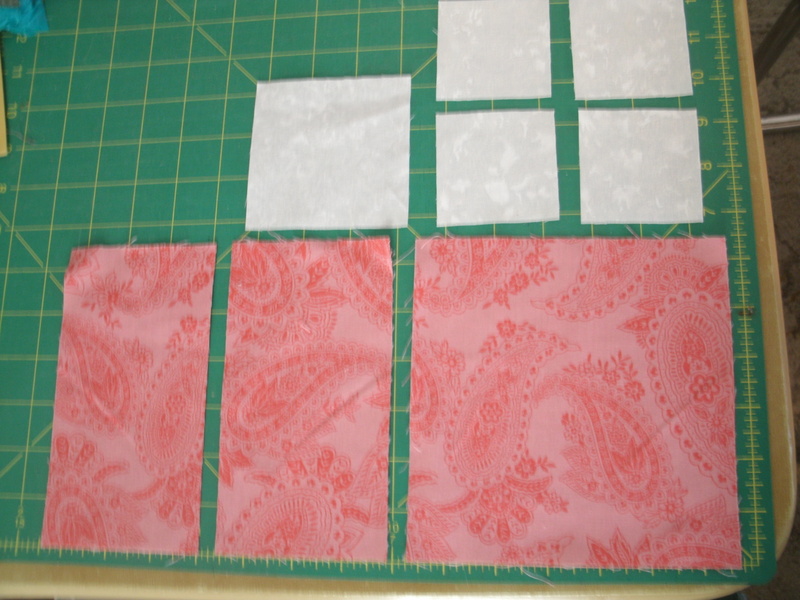 Recently I was cutting some fabric leftovers and discovered I was winding up with a lot of 4.5″ and 2.5″ squares. a few months ago, I finished a quilt with Sawtooth Star blocks made with fabrics from each of the projects I’ve made over the past couple of years. 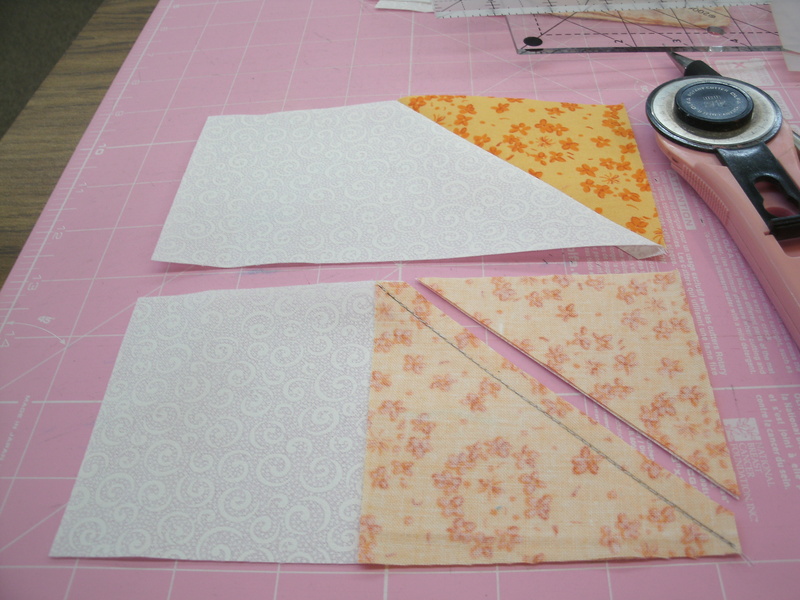 After I finish a project, I cut up any leftover strips of fabric less than a quarter-yard into Thrifty Quilter pieces for use later in scrap quilts. I decided to go ahead and make up an 8″ Sawtooth Star or two, and set them aside, adding to the stack until I had enough for a quilt. All the rest of the pieces went into my TQ bins. I was surprised at how quickly I collected the 35 blocks I needed for this 44″ x 60″ quilt! I like this little quilt. It’s really a material diary of my projects for 2015 and 2016! I decided to do another star quilt “diary” for this year’s projects, which will include class samples, demo samples, a challenge project, and charity quilts. 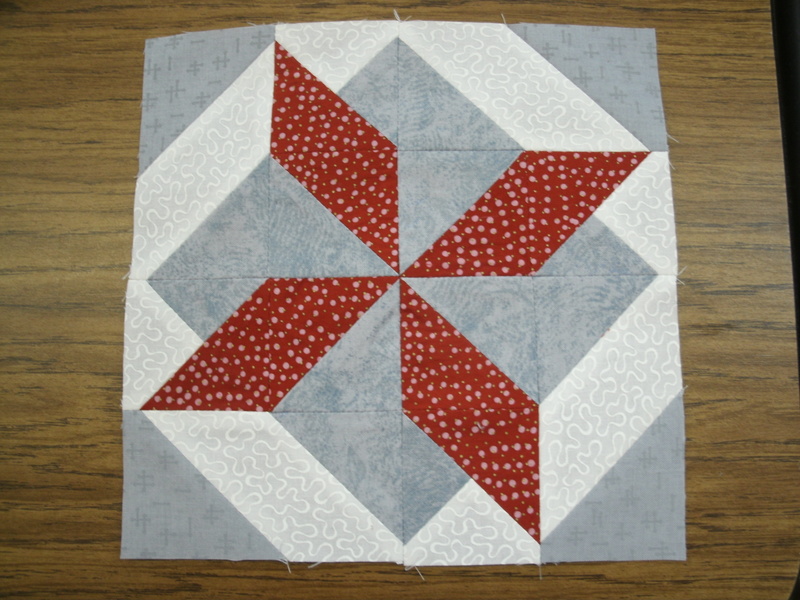 Looking at my growing collection of 2.5″ squares and 4.5″ squares, I decided on a variation of the classic “Ohio Star” block. I’m thinking this quilt will become a class for the Tucker Trimmer® rotary cutting tool, because I’ll be making a lot of half-square triangles (HSTs) and quarter-square triangles (QSTs). Let’s begin construction by making the HST. For this, you need the two 4.5″ background (white) squares, and two of the 4.5″ star background (light teal) squares. 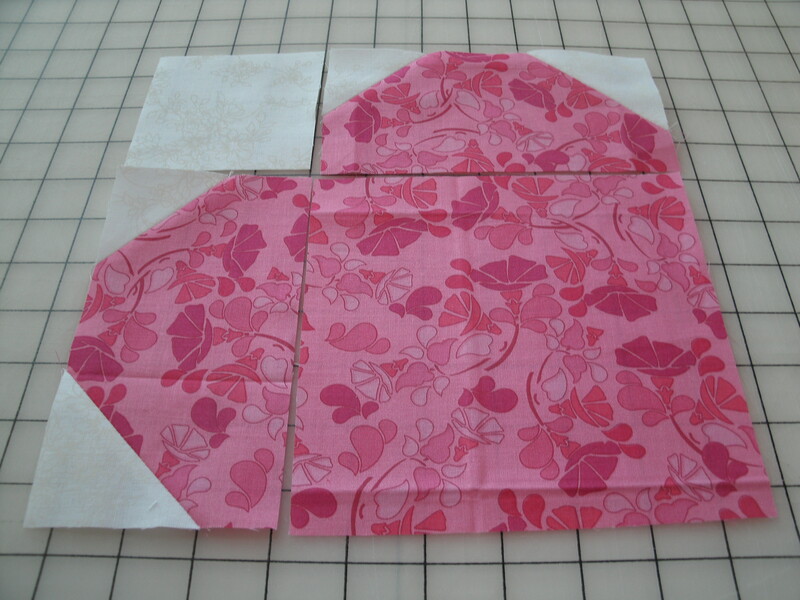 Cut each square diagonally and sew into two HSTs. Step 1. Lay the Tucker Trimmer® on the HST, aligning the diagonal line with the seam line. Be sure the HST extends beyond the 3.5″ vertical and horizontal dashed lines on the tool. Step 2. Trim the right and top edges. Step 3. Rotate the HST, line the diagonal line up on the seam again. This time the cut edges snug right up to the 3.5″ vertical and horizontal dashed lines. Trim the right and top edges. You now have four perfect 3.5″ HSTs. 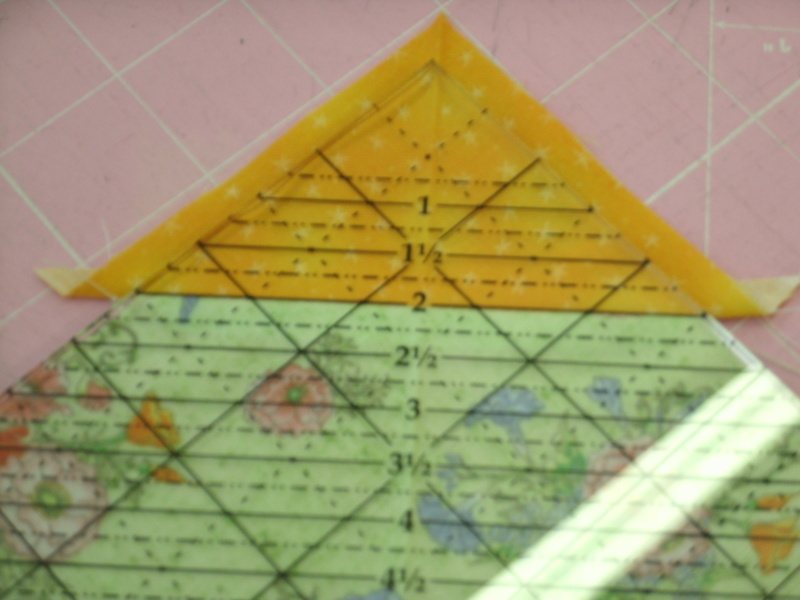 To be honest, you can do this with any small ruler that has a diagonal line in the corner. The Tucker Trimmer® earns its keep when we make QSTs, and we’ll do that now. 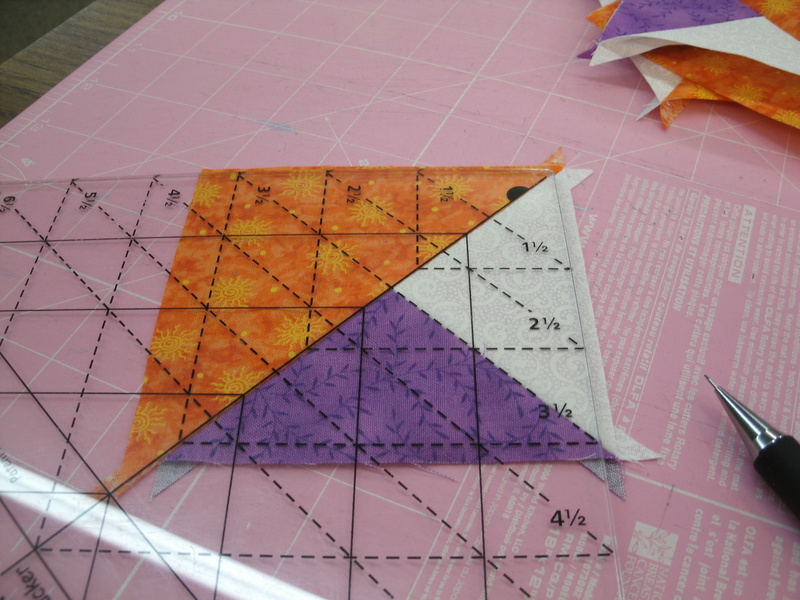 Cut the remaining 4.5″ star background (light teal) square, the 4.5″ accent diamond (light orange) square, and two star point (dark teal) squares diagonally twice, and sew into four QSTs as shown. When you look at the tucker trimmer, you’ll notice that in addition to the solid diagonal line from corner to corner, there are dashed diagonal lines running in the opposite direction. When making QSTs, you line the solid diagonal line with one diagonal seam, and the appropriate (3.5″ in our case) dashed diagonal line with the other seam. Trim two sides, rotate and trim the other two sides, as you did before. 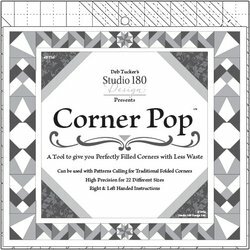 Lay out your center square, star point units and corner units as shown at right. This would be one variation of this block, and you may decide this is the look you want. I’m going to set my blocks side-by-side, which will leave large white diamonds in the corners where the blocks come together. If I were going to send this quilt to a certain longarm artist I know, I’d leave that as a canvas for her to show off her mad skills. Instead, I’m going to add accent triangles to those white corners. 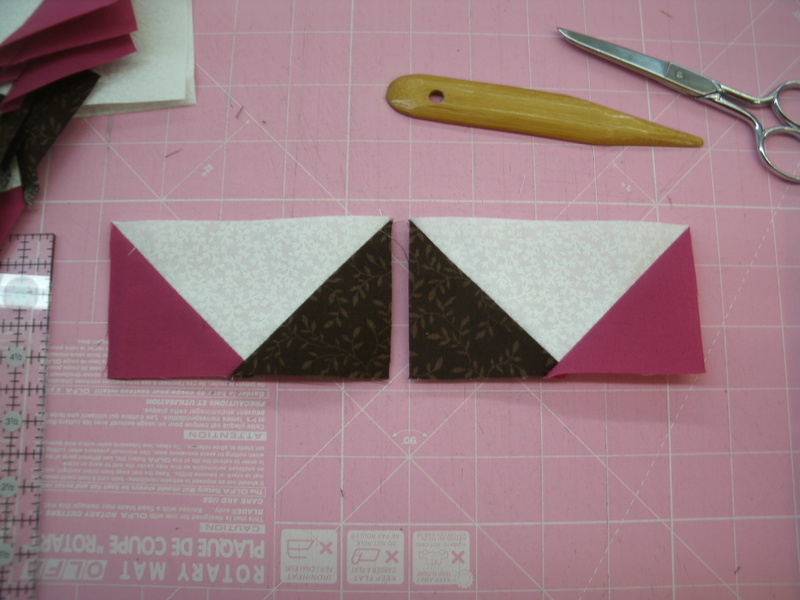 We’ll use the stitch-and-flip method for these accent triangles. Step 1. Draw a diagonal line on the back of the 2.5″ accent (dark orange) squares. 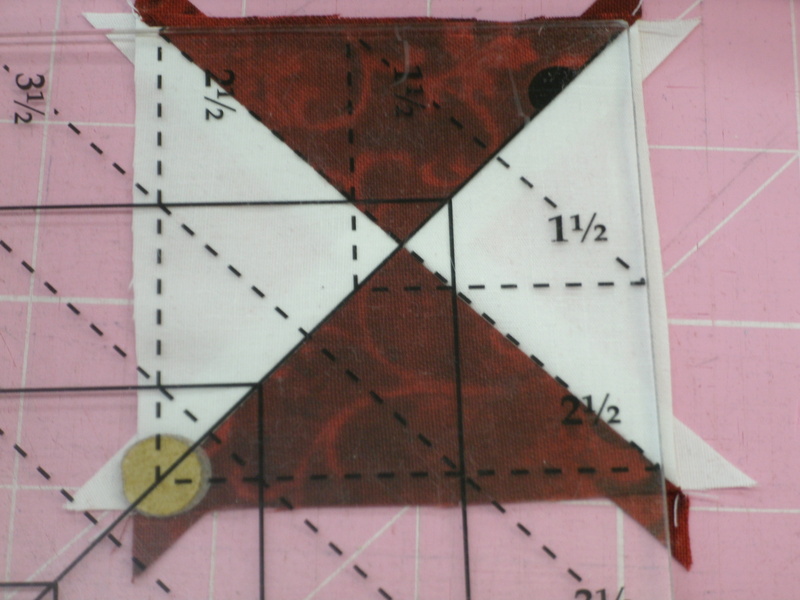 Align the square with the white corner on the HST, and sew on the drawn line. Step 2. Trim 1/4″ outside the seam line. Step 3. Press the corner into place. Now you can lay out the center square, corner units and star point units. 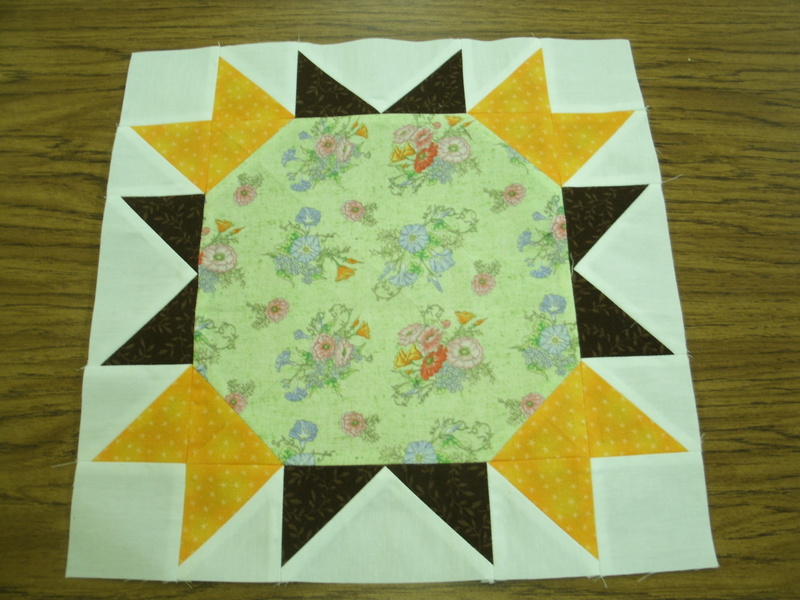 Sew into rows and sew the rows together to complete your Ohio Star block. My plan is to make and collect these Ohio Star blocks until I have about twenty. I have a pretty interesting border treatment in mind that would be kind of traditional, but kind of modern. In my mind, it’s a great quilt. Time will tell if it translates to fabric! Once again, the folks across the street and a couple doors down put on quite a fireworks show last evening. It was interrupted by a pretty serious thunderstorm, but eventually Mother Nature conceded. Her lightning show, though pretty impressive, couldn’t beat the neighborhood pyrotechnics. 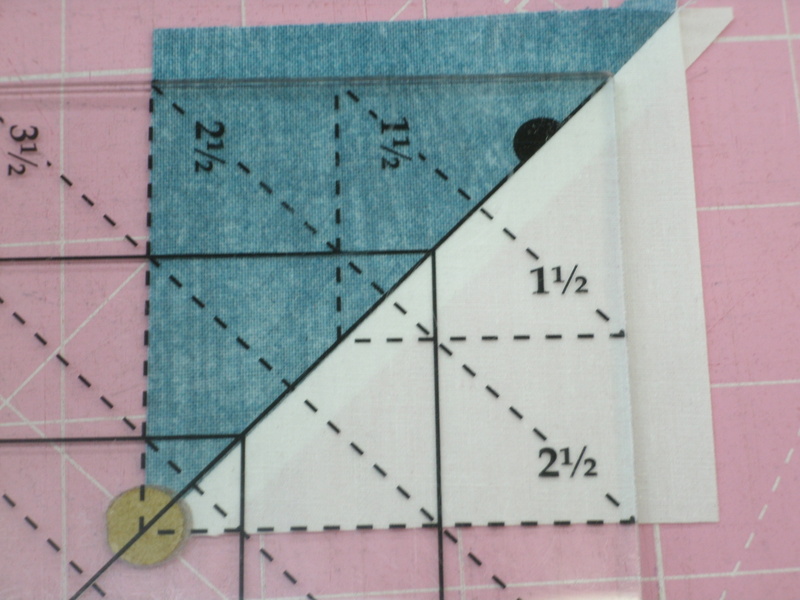 Step 1a – Cut the 3.5″ light blue and two of the white#1 squares diagonally, and sew into 4 half-square triangles (HSTs). 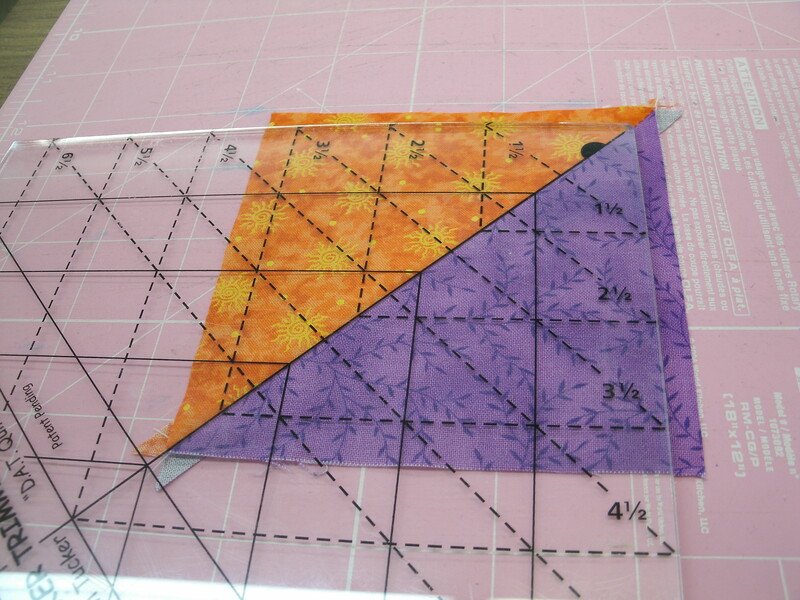 Use a Tucker Trimmer® or another ruler with a 45° line in the corner to trim the HSTs to 2.5″. 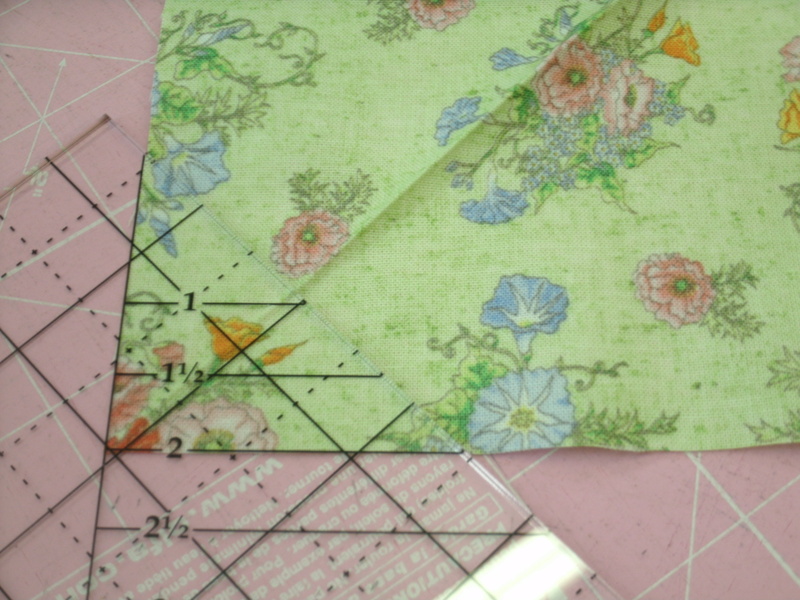 Lay the trimmer on the HST with the diagonal line on the seam, and the piece extending beyond the 2.5″ dotted lines. Trim the right and top edges. 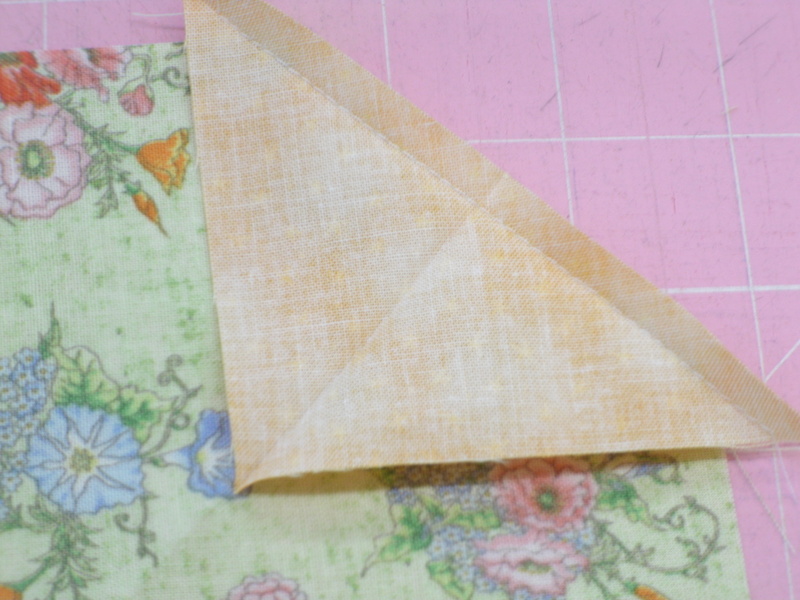 Step 1b – Rotate the HST and lay the trimmer on it again, aligning the diagonal line with the seam. This time the piece should line up with the 2.5″ dotted lines. Again, trim the right side and top. 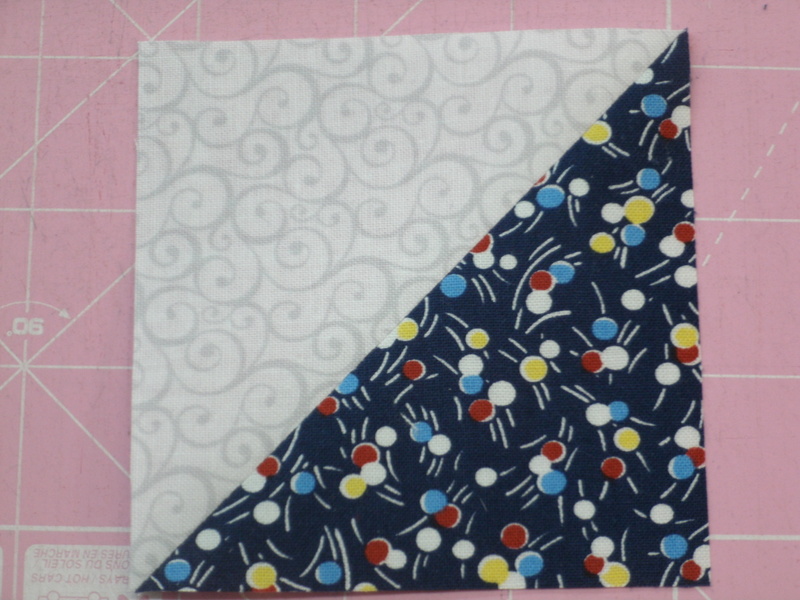 Make 4 light blue and white HSTs. 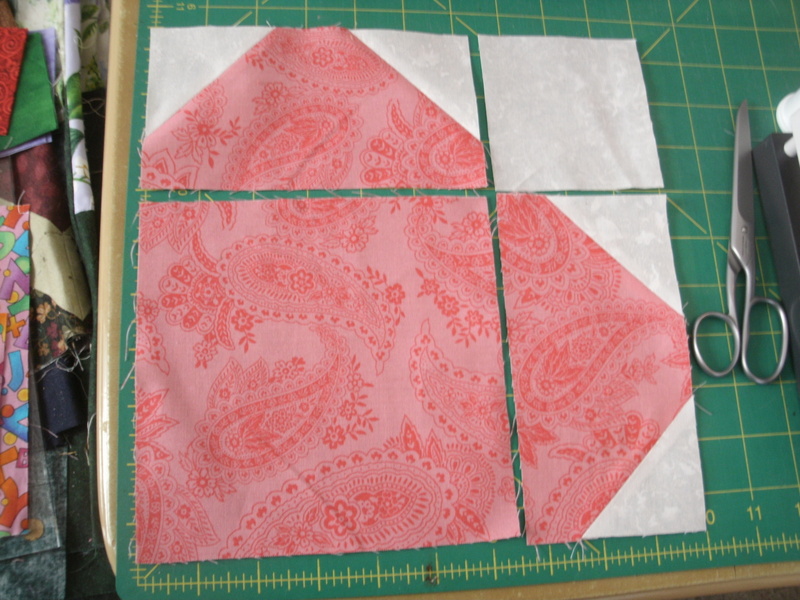 Step 2a – Cut the 3.5″ red squares and 3.5″ white#1 squares diagonally twice and sew into four quarter-square triangles (QSTs). Trim the QSTs to 2.5″. Notice that the Tucker Trimmer® gives you a dashed 2.5″ line so you can align the ruler with both seams. This is an incredibly handy tool to have in your collection. Step 2b – Rotate the QST, re-align the trimmer and trim the right and top edges. Make 4 red and white#1 QSTs. 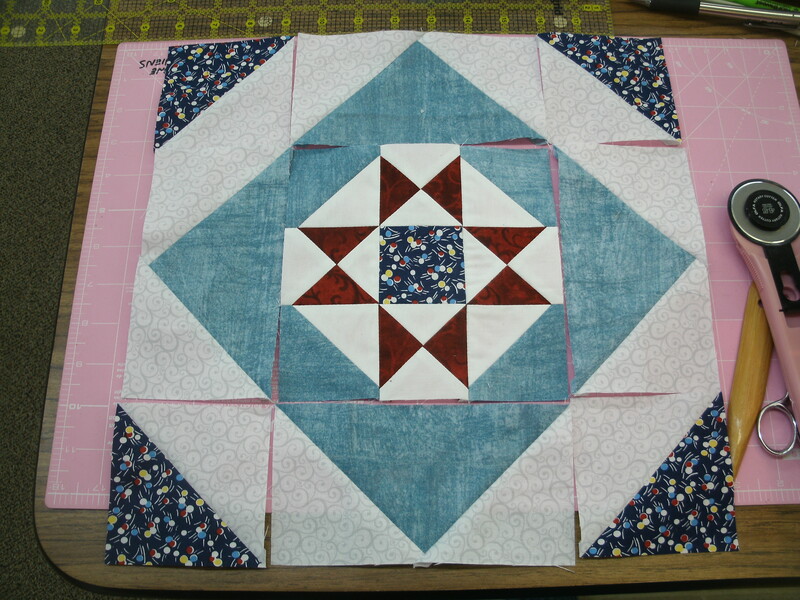 Step 3 – Now you can lay out the HSTs, QSTs and the 2.5″ dark blue square and sew into a star. This is the center of your block. Set it aside. 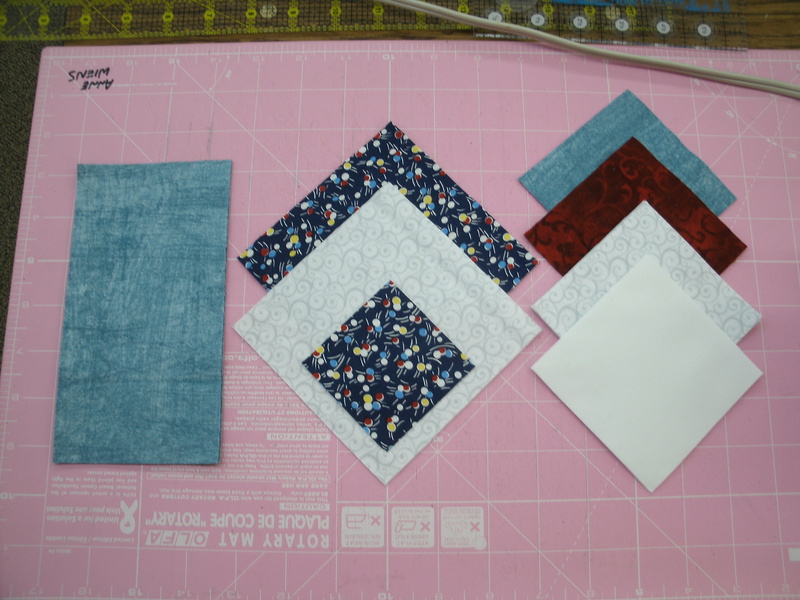 Step 4 – Cut the 4.5″ dark blue and white#2 squares diagonally once. 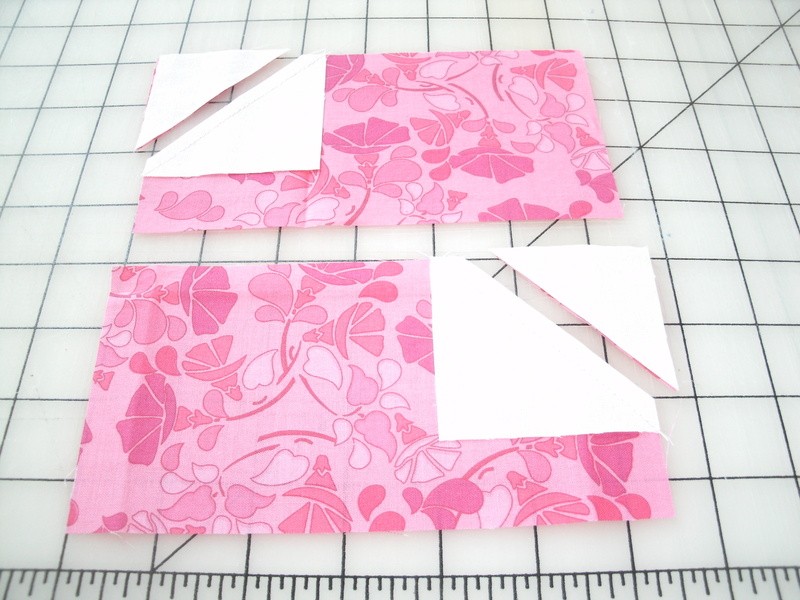 Make four HSTs and trim each one to 3.5″ square. Set these aside. 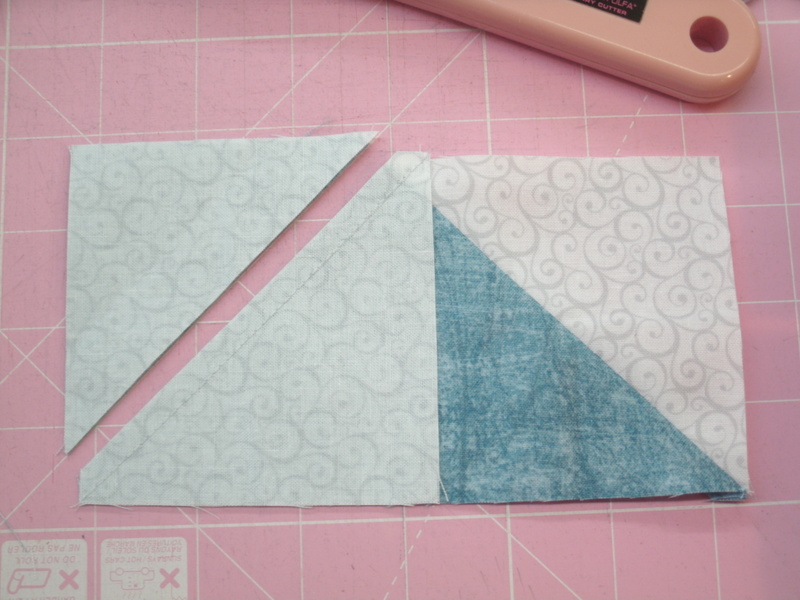 Step 5 – “Use the Stitch and Flip” method to make four flying geese units from the 3.5″ x 6.5″ light blue rectangles, and the 3.5″ white#2 squares. a- Draw a diagonal line on the back of each white square. Align the first square with the right edge of the rectangle so the line runs from top center to lower right. Sew on the line, trim 1/4″ to the right and press open. b (illustrated here) – align the second square with the left edge of the rectangle with the line running from top center to lower left. Sew on the line, trim 1/4″ to the left and press open. Note: Do not throw those “waste” triangles away. I have a block coming in September that will use them! 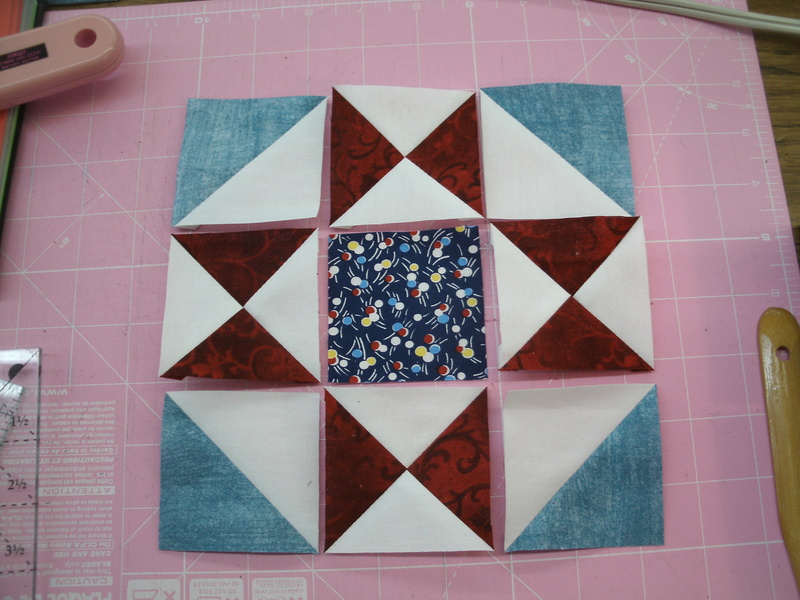 Step 6 – To finish, lay out the center star, the flying geese units and dark blue HSTs and sew together, completing your “4th of July” block. 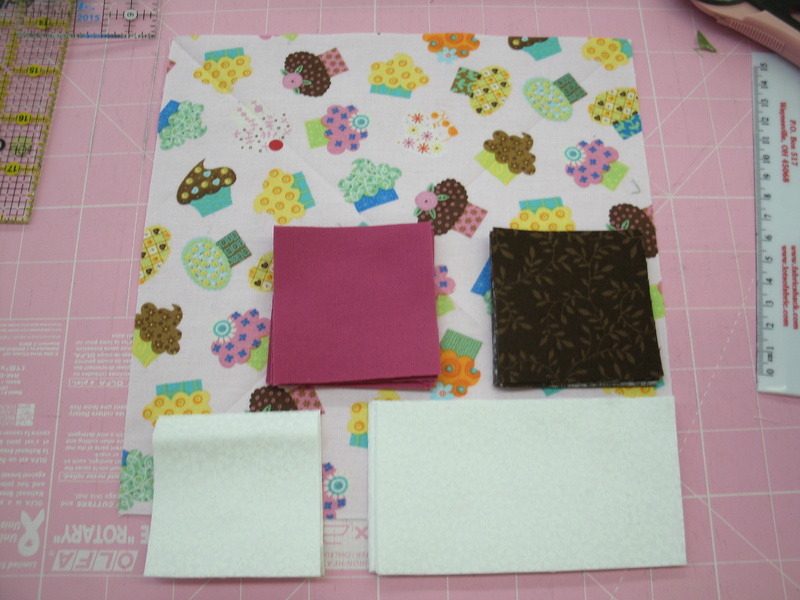 Next time – a block to show off those larger novelty print scraps. 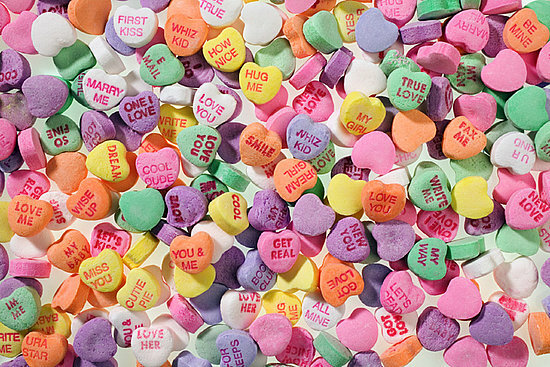 In my last post, I showed you a couple of ways to make a “Candy Heart” quilt block. In the end, I did neither. 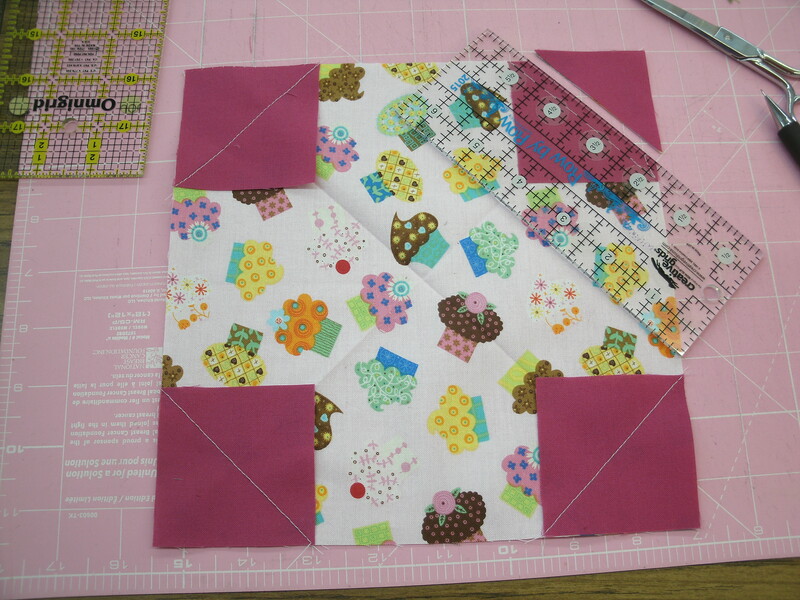 I made 20 Candy Heart blocks, and sewed them into four rows of five blocks each. 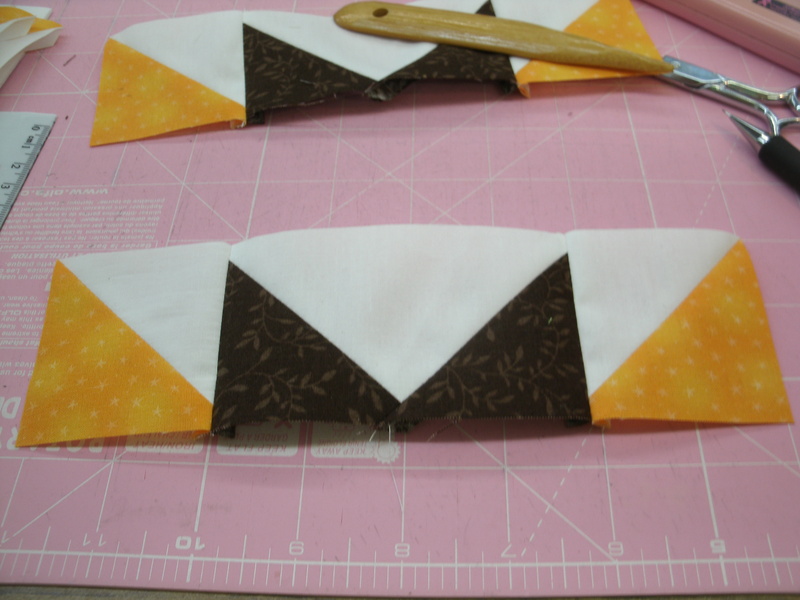 The sashing strips (5 of them) are 3″ wide. The top and bottom border rows are made of fifteen 3″ Squares. I made my blocks using Option 2 in the Candy Hearts Blocks post. 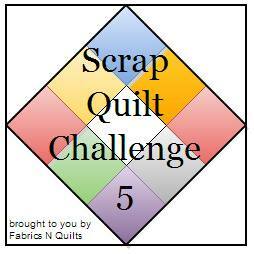 I started with twenty 10″ squares of assorted brights, plus ten more 3.5″ print squares. I needed 1.5 yards of white-on-white. 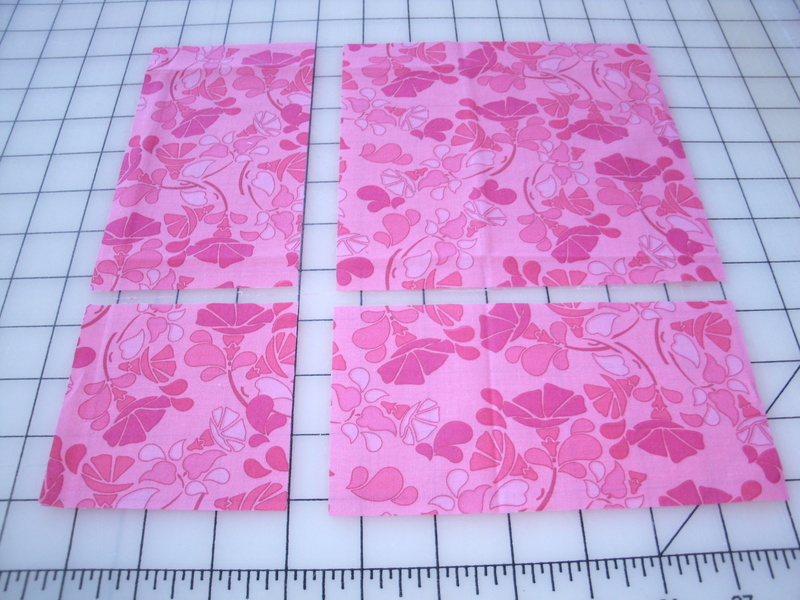 Cut three 3.5″ x WOF (Width of Fabric) strips and cut into thirty 3.5″ squares. You will need twenty of these squares for the blocks. Cut five 3.5″ x WOF strips and trim to 39.5″ long. 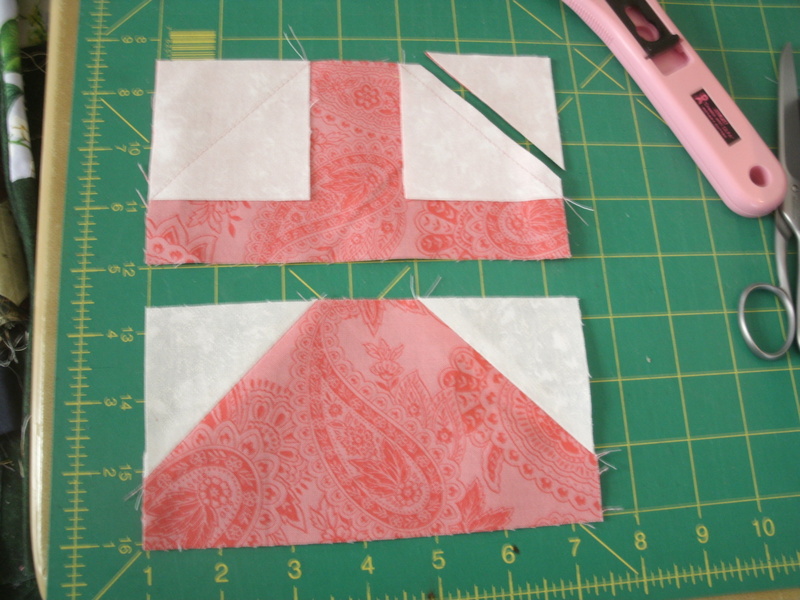 Sew a 3.5″ square to both ends of each strip. These are your sashing strips. 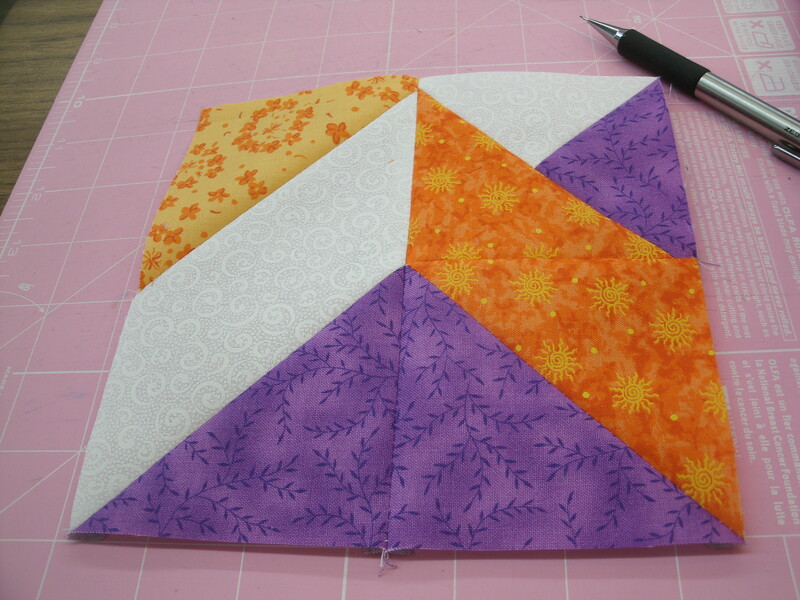 Cut three 2.5″ x WOF strips and cut into forty 2.5″ squares for the blocks. 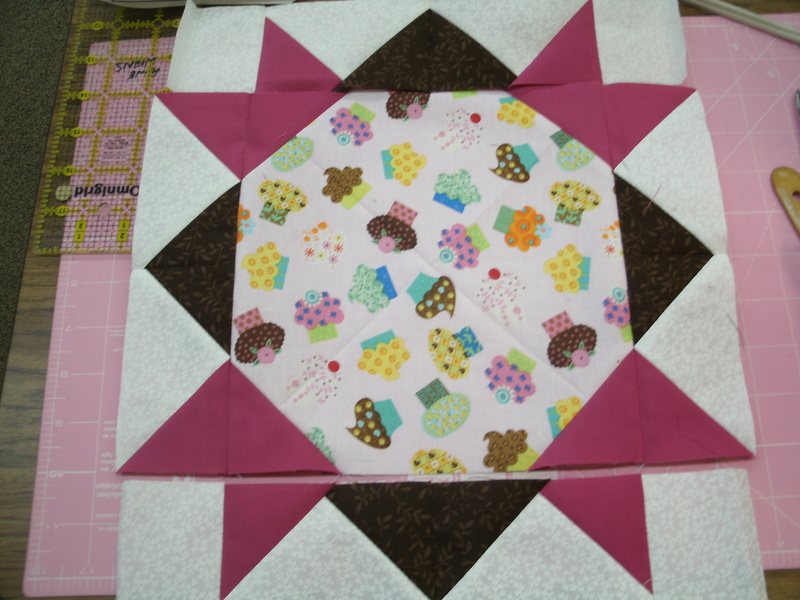 Cut two 2″ x WOF strips and cut into forty 2″ squares for the blocks. 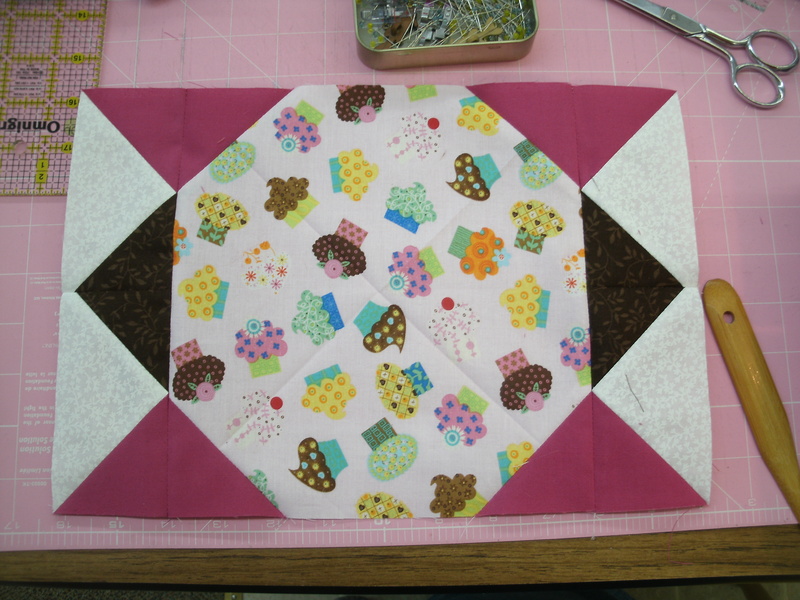 Sew the blocks into four rows with five blocks in each row. Separate the rows with the sashing strips. 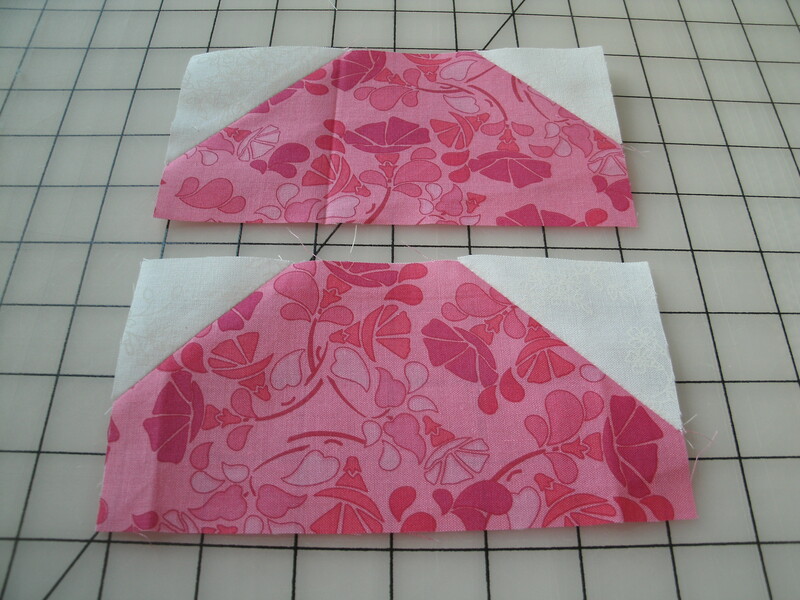 Sew two sets of 3.5″ squares with fifteen squares in each row. Add these to the top and bottom of the quilt top. Cut six 2.25″ x WOF strips for binding. If you prefer a 2.5″ binding strip, you will need 1-5/8 yards of white instead of 1-1/2 yards. 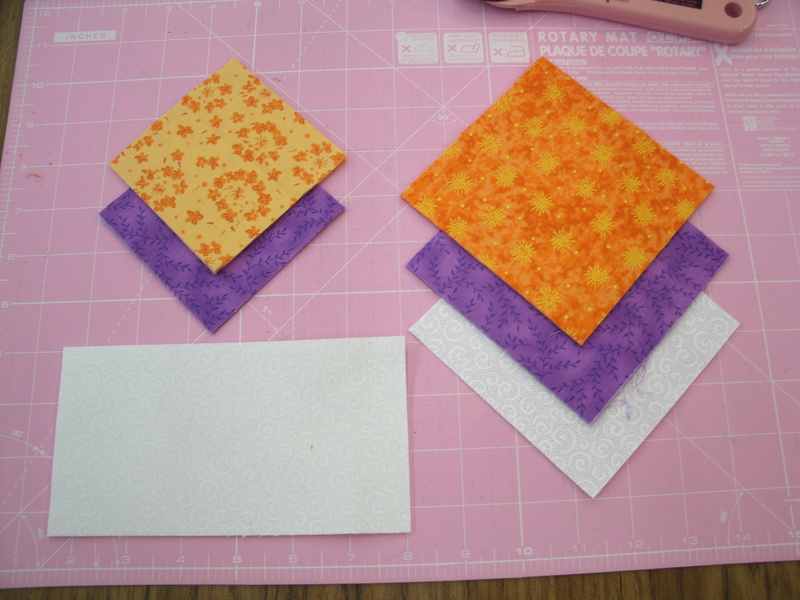 Cut three 3.5″ x WOF squares and cut into thirty 3.5″ squares for blocks. Cut four 2.5″ x WOF strips and cut into sixty 2.5″ squares for blocks. 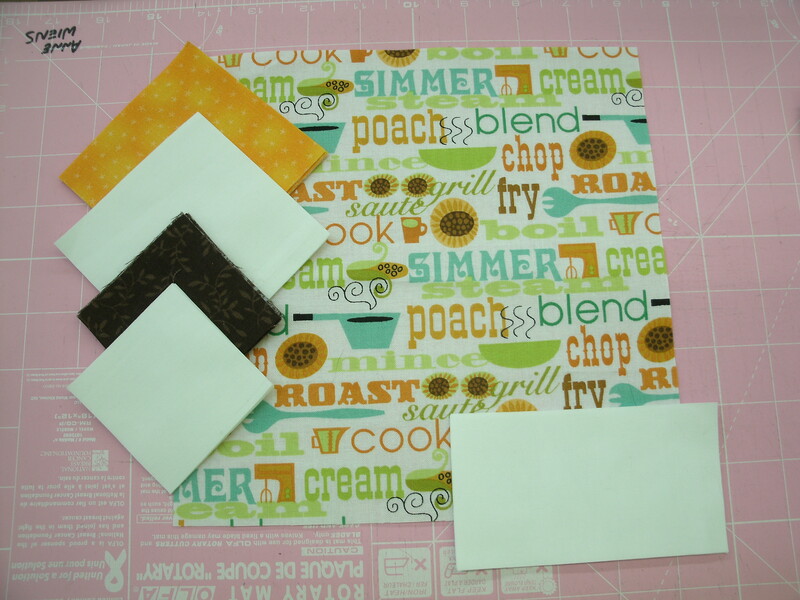 Cut three 2″ x WOF strips and cut into sixty 2″ squares for blocks. Cut six 3.5″ x WOF strips and trim to 39.5″ long. Cut three 3.5″ x WOF strips. Cut two 15.5″ strips from each, and sew one to each of the 39.5″ strips. These are your sashing strips. Sew the blocks into five rows with six blocks in each row. Separate the rows with the sashing strips. 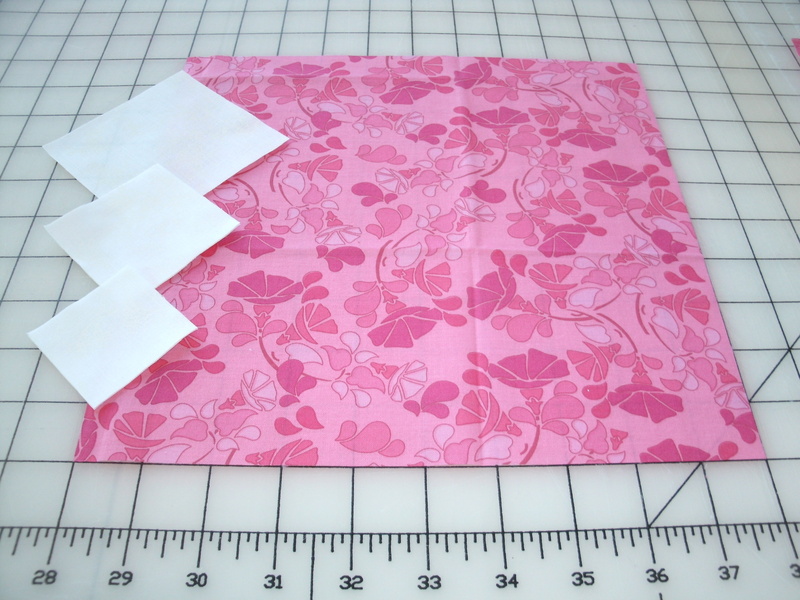 Sew two sets of 3.5″ squares with eighteen squares in each row. Add these to the top and bottom of the quilt top. Cut eight 2.25 (or 2.5″) x WOF strips of white for binding. I have a very special project coming up for you in April. I’m dying to tell you about it, but sworn to secrecy for a little while longer. Meanwhile, I’m dreaming of spring and working on a little “Crocus” block for you next. I like the pattern, but decided there needs to be more contrast between the gray in the diamond and the gray in the corner triangles. Because you can’t see the print in the grays, you really can’t tell they are two different fabrics. 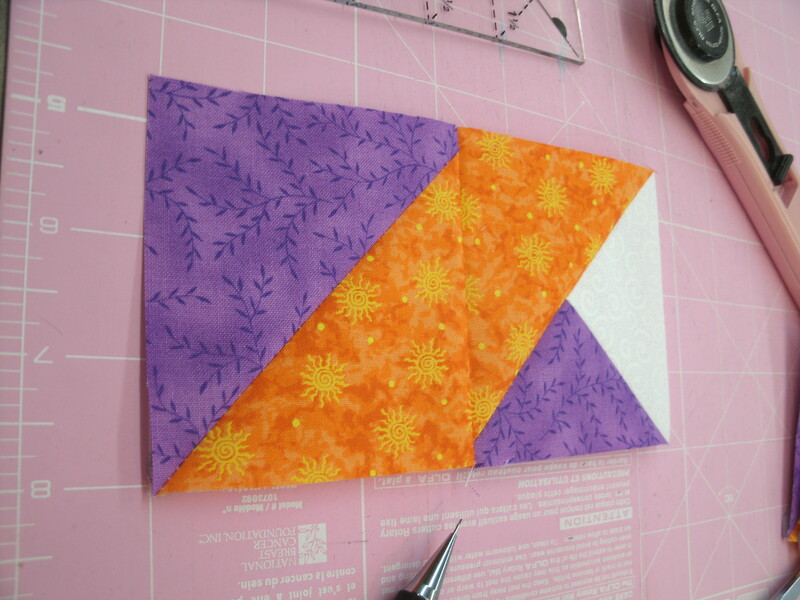 This month I posted a photo of a colorful little bird with purple wings, yellow neck and tail feathers, and a bright orange head and then I took another run at this block, which I call “Diamond & Pinwheel”. White: One 4.5″ square and four 3.5″ x 6.5″ rectangles. 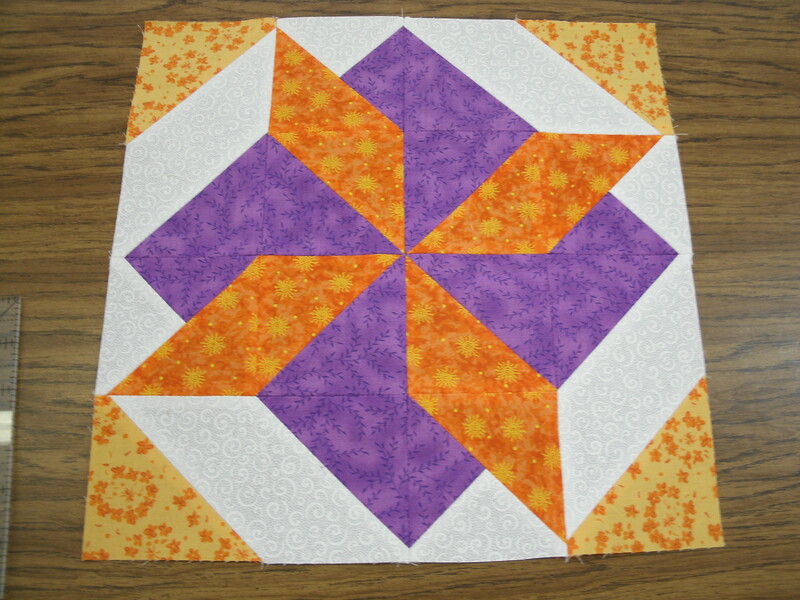 Step 1 – Use two 4.5″ orange squares and two 4.5″ purple squares to make four orange/purple half-square triangles (HSTs). Trim to 3.5″. You can do this with any ruler that has a 45° line in a corner. The photo shows a Tucker Trimmer®. Lay the ruler on your HST with the diagonal line on the seam and trim the top and right sides. Rotate the piece, align the diagonal line with the seam and trim the top and right sides. Set these HSTs aside. Step 2 – Now we need to make four units that I call “triple triangle squares” (TTSs), because they have three triangles in them…two small and one large. 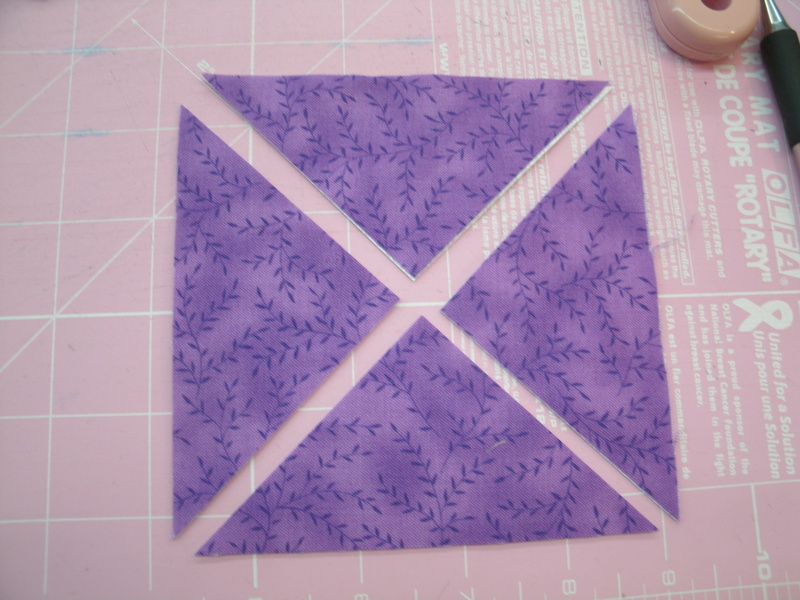 Start by cutting one 4.5″ white square and one 4.5″ purple square diagonally twice. 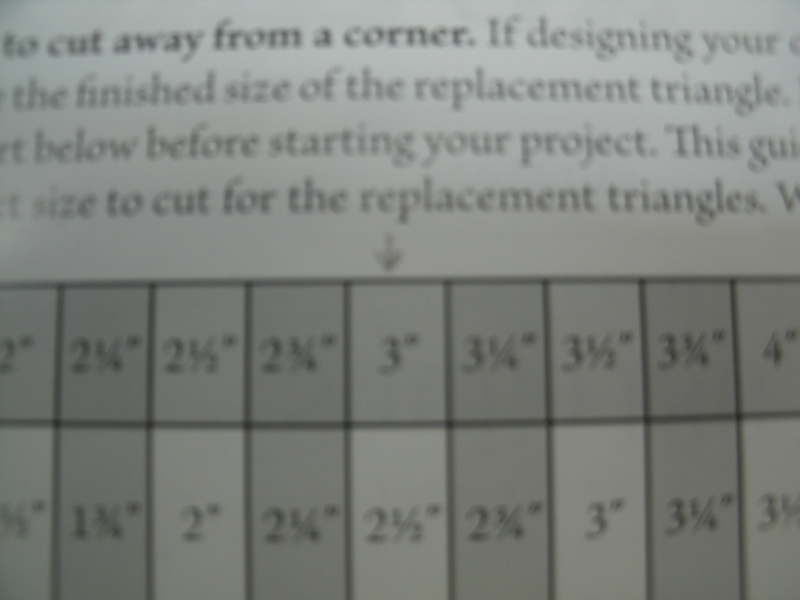 Cut two 4.5″ orange triangles diagonally once. You should now have four small white triangles, four small purple triangles and four large orange triangles. 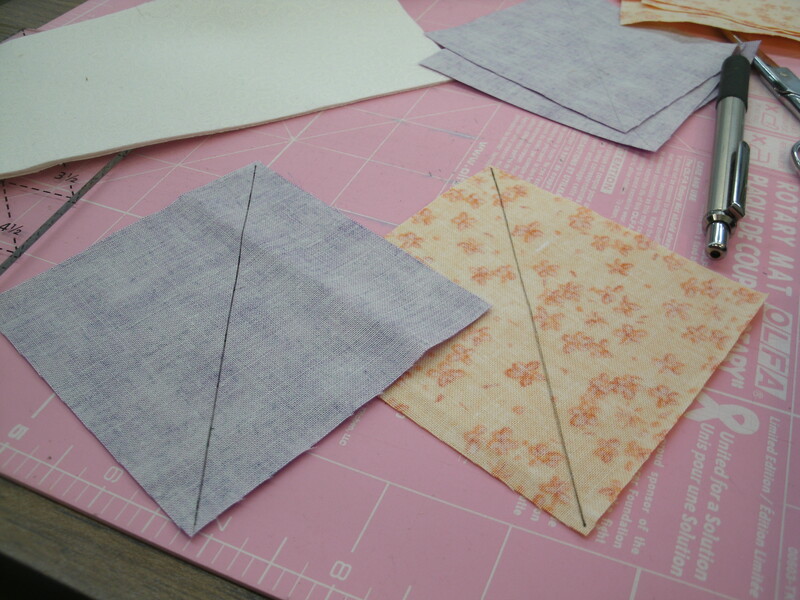 Sew the triangles into four units that look like the one in the photo above. Be sure your white and purple triangles are in the correct positions. Trim unit to 3.5″. 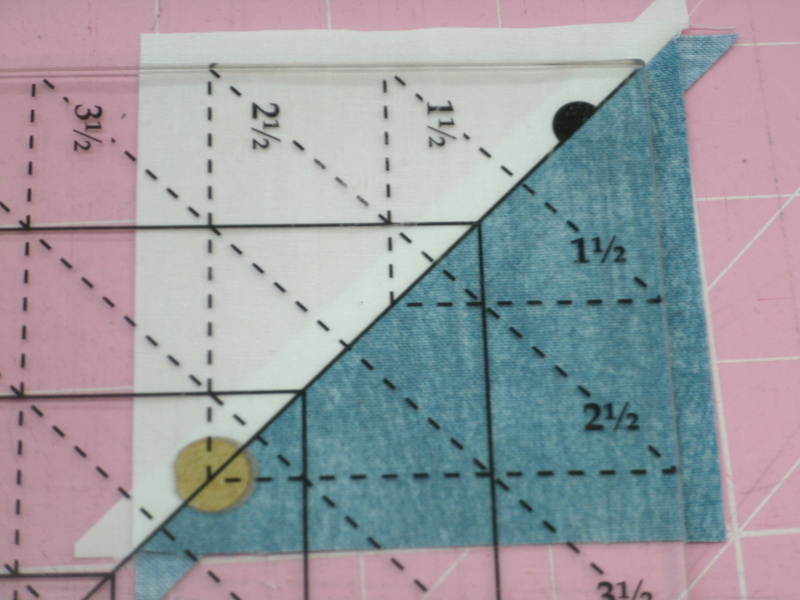 If you’re using the Tucker Trimmer®, notice that the solid diagonal line is on the long seam, and the broken diagonal line marked “3-1/2” is on the short seam. Trim the top and right sides. 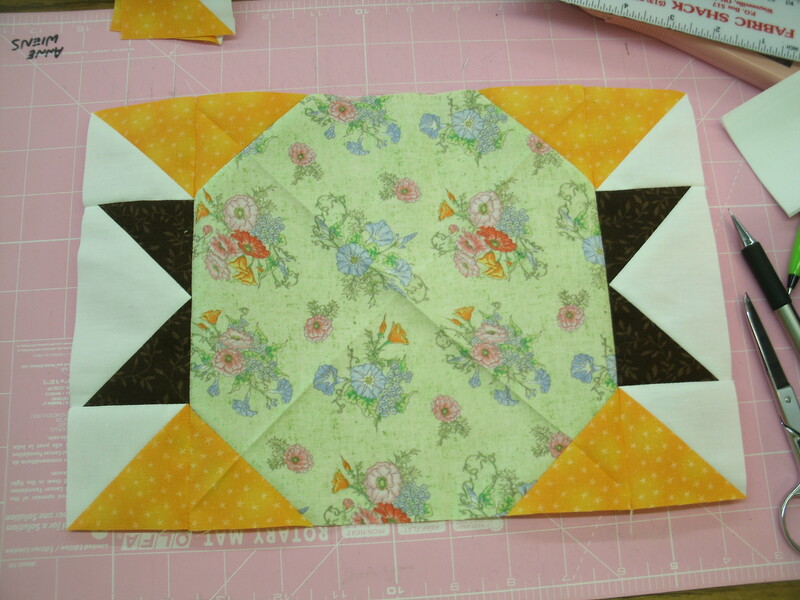 Rotate the piece, align the diagonal lines with the seams, and trim the top and right sides again. 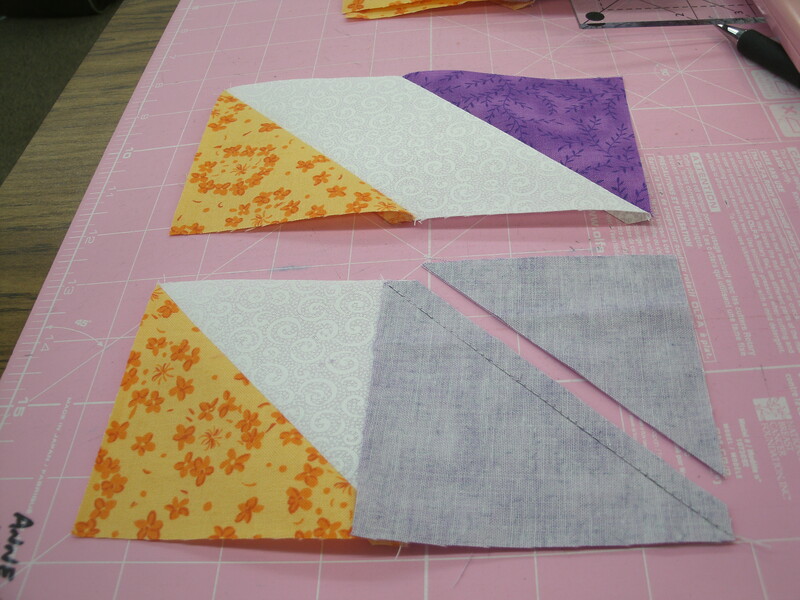 Step 3: Sew the HSTs to the TTSs as shown, and set these four units aside. 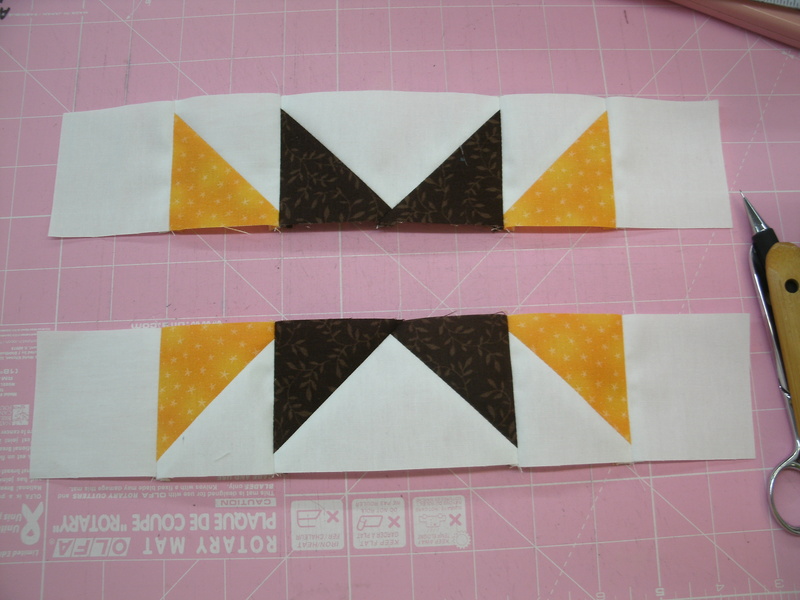 Step 4 – Now we need to make four “blade” units, using the stitch-and-flip method. 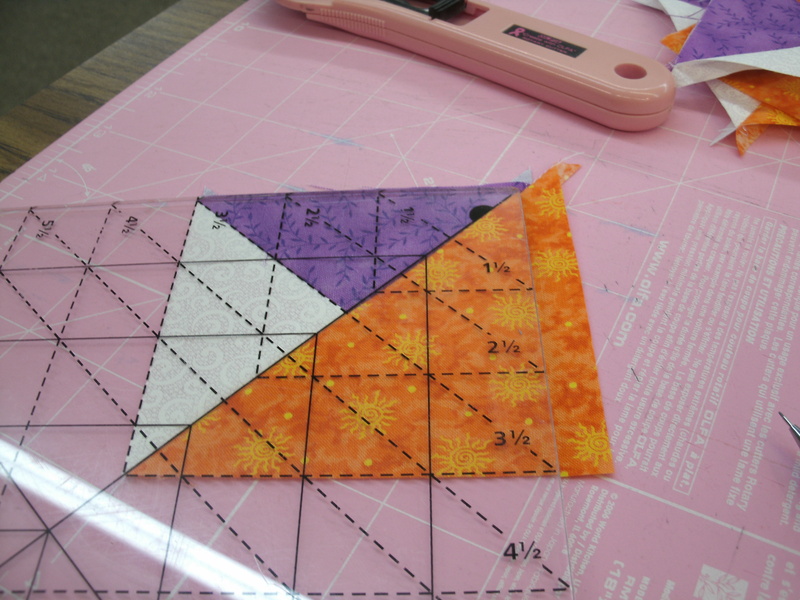 Draw a diagonal line on the back of each of the 3.5″ purple squares and 3.5″ yellow squares. The dark lines in the photo are for illustration only. To mark my squares for sewing, I use a drafting pencil with a #4 hard lead. Your lines should be just dark enough that you can see them. Align the yellow squares with the right edge of the white rectangles as shown above. Sew on the drawn line, trim 1/4″ away from the seam*, and press open. 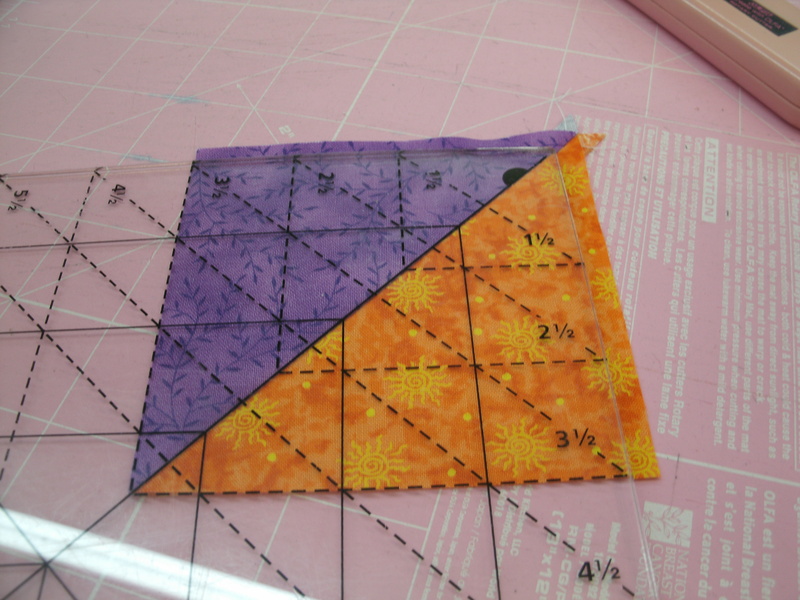 Rotate the units and align the purple squares with the end of the white rectangle, sew on the drawn line, trim 1/4″ from the seam* and press open. *Note: If you don’t want to waste those cut-away triangles, sew the bias edges and trim them to 2.5″ squares for use in other projects. You’ll find several ideas in previous posts on this blog. We’re nearly finished. 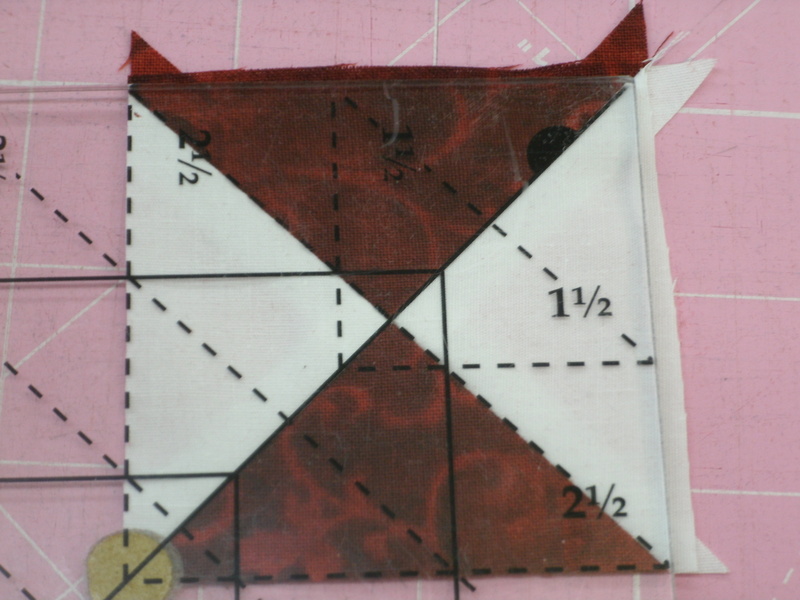 Step 5 is to sew the units you’ve made into four quarter-units as shown above. 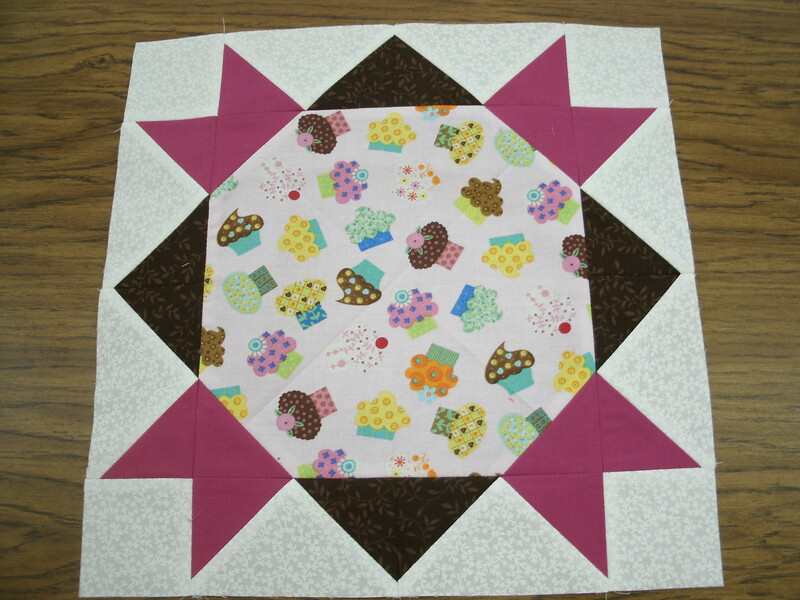 Step 6 – Sew the four quarter-units together as shown, to complete your Diamond & Pinwheel block.